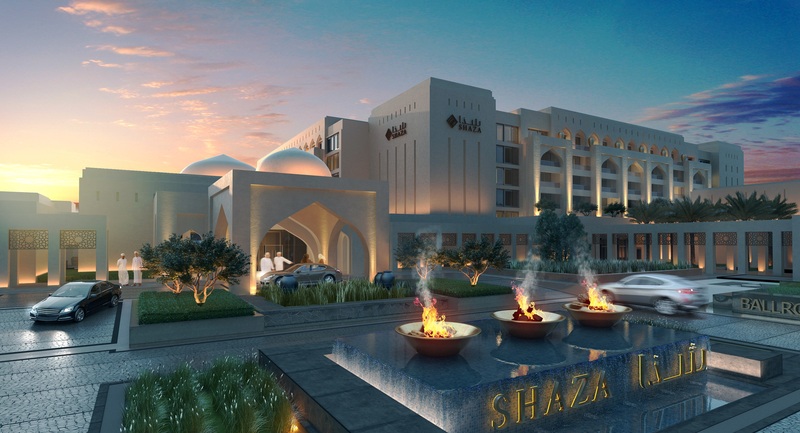 As the Shaza Salalah Hotel & Resort moves into the final stages of construction, Godwin Austen Johnson reveal the vision behind the design of this luxury resort. We also employed the same approach with the 66 villas which were arranged to take advantage of the change in levels and to ensure that they all enjoyed the same views of the sea and were each provided with direct access to the beach. The Dubai based British firm of architects have maintained a technical advisory role during the construction works on site to ensure that the final result stayed true to the architects’ initial vision. “The client and the operator both shared a common vision for a contemporary property but which also acknowledged Oman’s rich cultural heritage and this was achieved by the addition of locally available materials and design elements including domes, arches and mashrabiya screens,” said Johnson. One of the key design features of the resort is the entrance which creates a magnificent sense of arrival. Driving through a domed gateway, guests are directed to either the hotel’s main entrance, to the spa or to the villas with a separate entrance for the ballrooms. Landscaped courtyards and water features open the hotel up to its surroundings providing clear use of spacing and vistas as well as access to the beach. The resort will set a new standard in hotel design in Salalah comprising 286 rooms and villas as well as four restaurants, two ballrooms, two swimming pools and a spa.